If you go outside on a clear, windy night, and look up, you should be able to see the stars twinkling their hearts out. Or if you’re in an area where you can see down close to the horizon, even if the stars overhead don’t seem to twinkle, the ones down lower might seem to flicker. On the other hand, if you go out on a clear, still night, and look at the same stars, you should find that they hang quietly in the night sky, not a twinkle to be spotted. The twinkling is entirely the result of our atmosphere being a bit of a mess. As the light from a distant star reaches the earth, all of the light is well aligned, and if you were to observe the stars from space, you would see them as perfectly point-like pricks of light. However, the atmosphere can quickly distort that alignment. Pockets of air which are slightly warmer or colder than their surroundings will bend the light a miniscule amount, but enough to spread out the light over a slightly wider area. As the light passes through our atmosphere, hitting more and more pockets of air, the starlight gets more and more bent out of shape, into weird, non-point figures. The atmosphere is also constantly changing - the image above is a series of images taken by William C. Keel, at the University of Alabama, with only a second’s wait between images. (Each image is about 1/100th of a second long.) 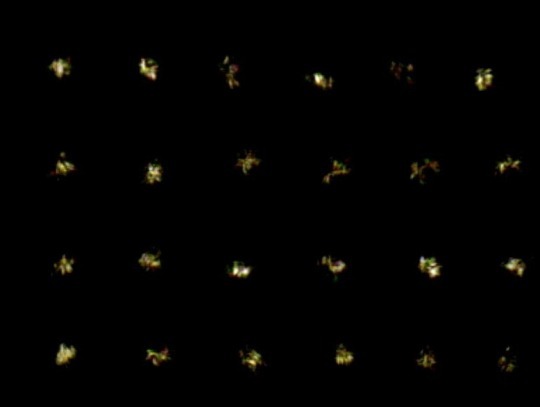 You can see how dramatically the images change between seconds - without the atmosphere, each of these images should look like a single dot of light. This is one of the biggest reasons that we like having telescopes up in space - we can get around the pesky atmosphere of ours. But it’s not something the stars are doing - if the stars are twinkling it just means that our atmosphere isn’t very stable that night.